New Year’s Day marks the right to begin anew for so many. Although we may know that our hope is our future, the past is over and done with, and there is no use crying over spilled milk, we often “forget” that each moment is indeed a new start. In the plethora of Facebook posts of January 1, my friend posted “I am a soul on fire”; it struck a chord. As I said in a January post, it would become my focus, my mantra, my mission for the year. From Ferdinand Foch, “The most powerful weapon on earth is the human soul on fire.” Foch, a French soldier, historian, and military theorist, lived 1951-1929. Edith Södergran, a Swedish-Finnish poet, lived 1892-1923. I don’t know if their paths ever crossed, if they read the same books, if their politics were completely dissimilar. Would they be willing to have tea and conversation on a snowy afternoon? Would they spit at each other if they encountered each other on the street? Perhaps they were complete non-entities to each other. Yet they have nearly identical sentiment. 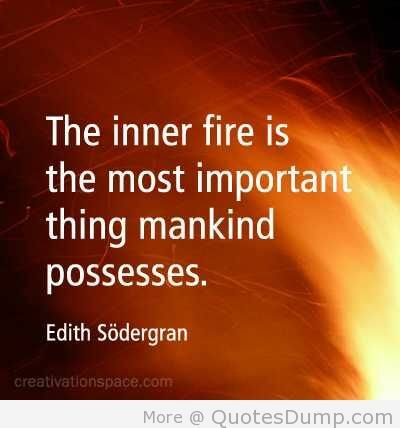 “The inner fire is the most important thing mankind possesses.” It’s a general theme for those who show passion for anything…life, hobbies, sport, love, philanthropy, the divine, a cause. Where is your fire? Is it hidden in a recess of your body? Is it stuck in a tight hip joint? Held in the tension of your shoulder? Does it reside in harmony with your very soul…and is it allowed to come out and play? Can I be a soul on fire? This entry was posted in Souls on Fire and tagged balance, balanced living, God, meditation, the journey. Bookmark the permalink.